NO PROGRAMMING KNOWLEDGE IS REQUIRED. Just edit a few files, upload the content on your server and in couple of minutes you’ll have a COMPLETE website already working. From CMS (Content Management System) start adding your informations. 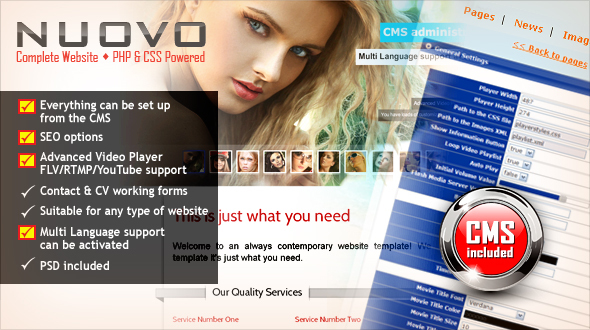 NUOVO comes with an amazing Content Management System. Everything can be managed using the customer-oriented interface which will make website maintenance a child’s play. It is also white label, so your clients will think you’re providing a custom made solution! 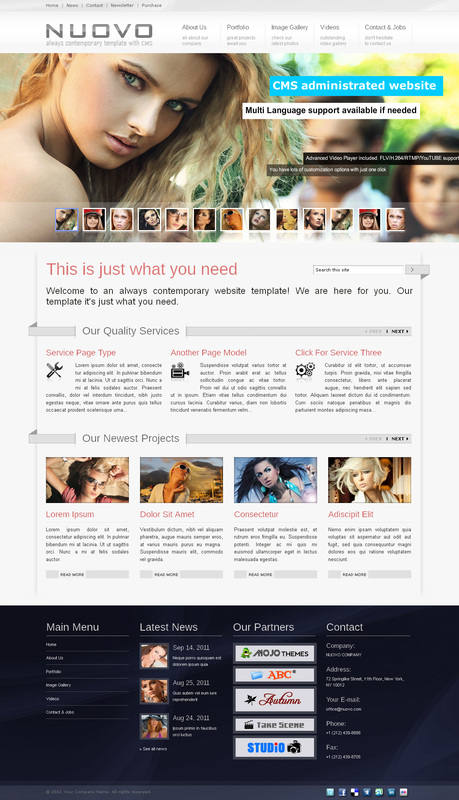 This template is perfectly suitable for both users with no programming experience as well as advanced programmers. For us, this was one of the first things on our to do list. Only if you need your website to have multiple language versions, you can activate the multi-language support and define the languages the website will offer. Please visit our online demo here. You’ll see the language selector on the top right side. Please refer to the CMS presentation page for previews. Please refer to the Typography page for demo. You can set this player to any size you want from CMS, changing the player width , the player height and the playlist width. - CMS DRIVEN CONTENT. Every setting can be set from CMS making it very easy to update. – It will play 16/9 and 4/3 formats. – Supports Html And Css Formated Text.